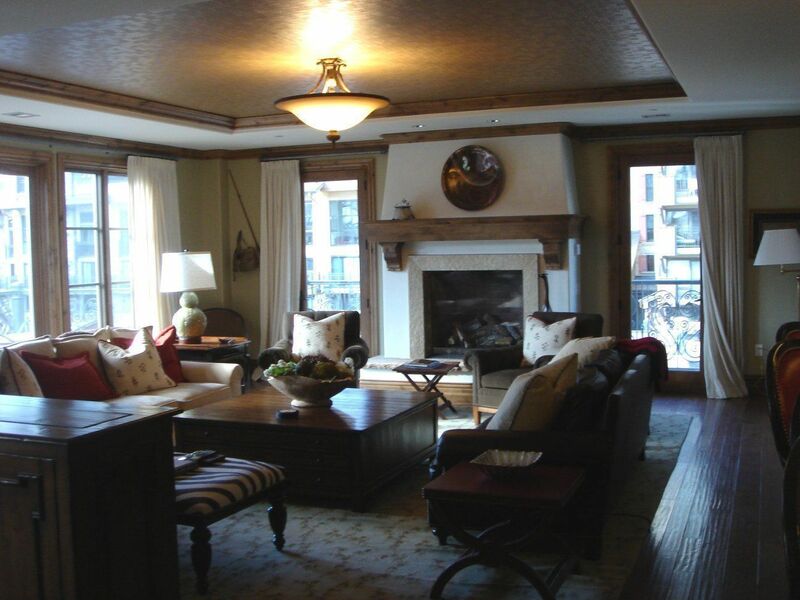 The 3 bedroom luxury condo at the Arrabelle at Vail. 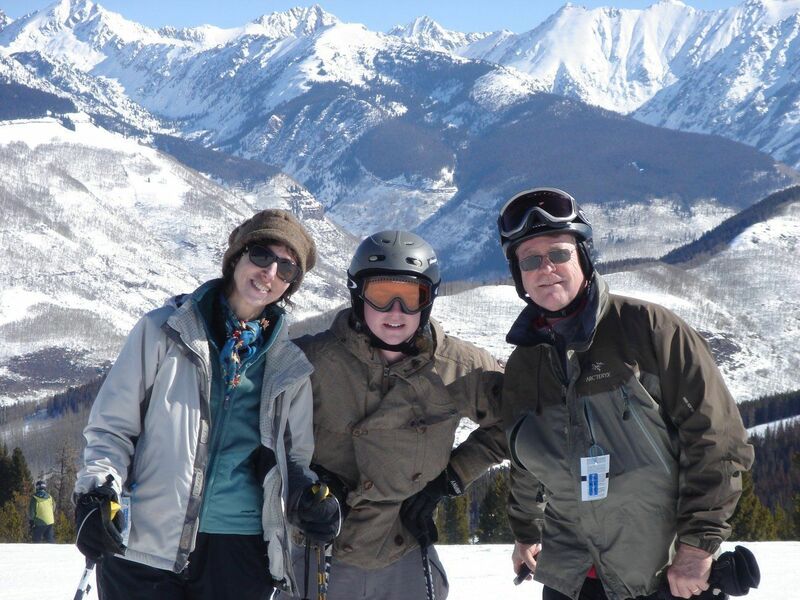 Our family portrait at Vail Mountain. 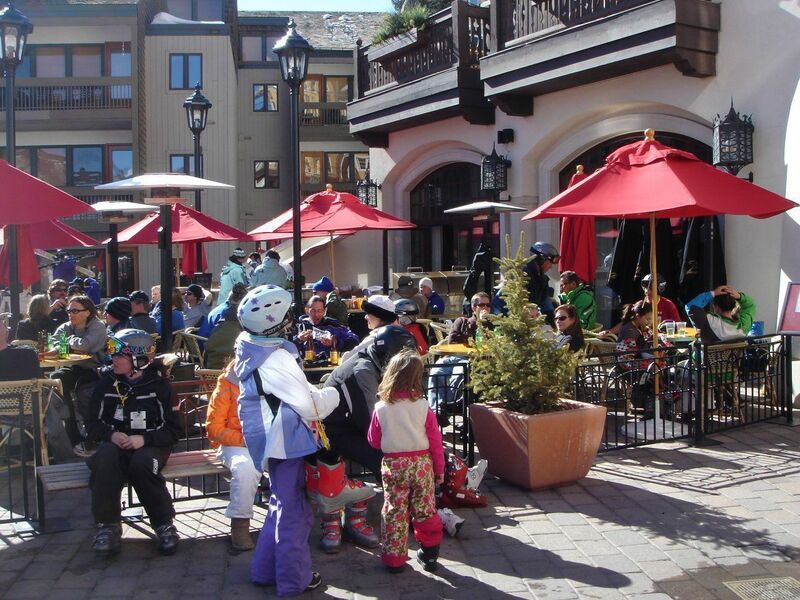 The cafes of Lionshead base village at Vail. 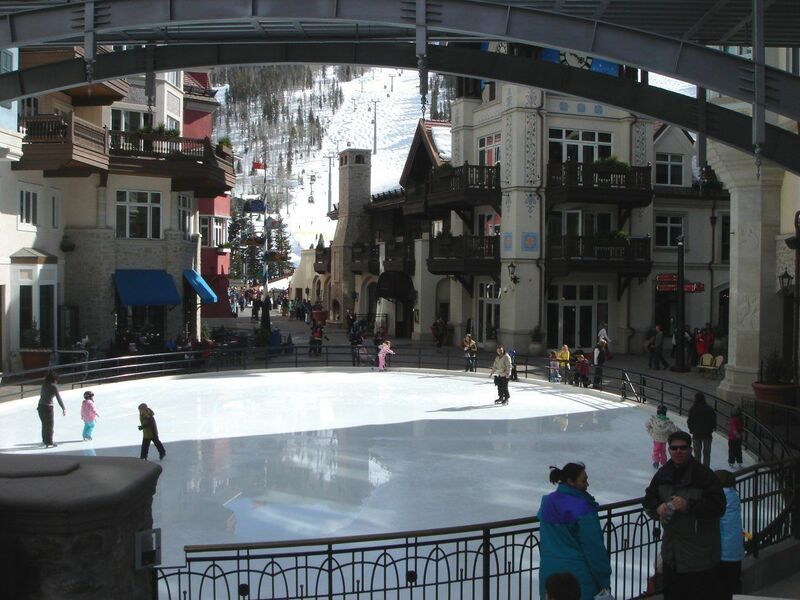 Skating rink at the Lionshead village is popular for apres ski. Tubing run at the mid-mountain Adventure Ridge. 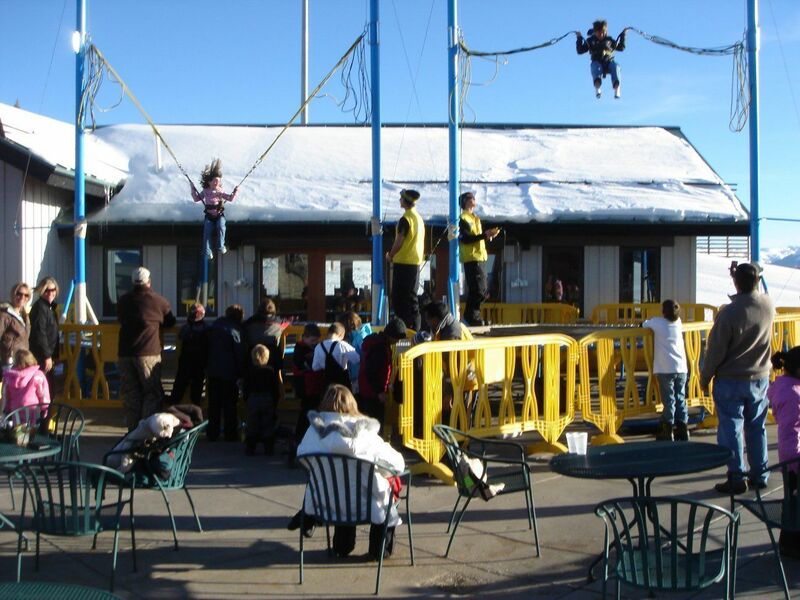 The trampoline at Adventure Ridge appeals to freestyle skiers and boarders. Luxury housing, friendly and flawless service, mountains outside the window, and Vail’s classy ambiance combine for a super family outdoor vacation at The Arrabelle at Vail Square, a Rock Resort. There’s no guarantee that with 55 rooms you’ll ever find a bed at The Arrabelle, but that doesn’t mean you shouldn’t try. The cornerstone luxury addition to the totally refreshed Lionshead base village at Vail, Colorado – arguably the most family-friendly of the three base villages – is well worth planning ahead for. It’s a beautifully constructed, European-inspired cluster of turreted buildings hugging the new central skating oval. From the frescoed fleur de lis, copper rain drains, and slate tile roofs, to the stunning rooftop lap pool, rustic stone and wood décor, it’s class all the way. As a RockResort, it belongs to a portfolio of ultra-luxe resorts that cater to a very demanding clientele. And they’re great at it, from the valet parking and complimentary Escalade transport between Lionshead and Vail Village’s superb restaurants, to the friendly, happy-to-be-working-there staff and gracious concierge. Don’t even ask about the chipper ski valets; they haul in snow-covered skis and boards as you exit the EagleBahn gondola, take your boots to be dried overnight, discuss your favorite run, then happily return your gear each morning, quickly and pleasantly. Lionshead Village and the slopes above it cater to familes year-round. The high-speed EagleBahn gondola takes all levels of skier/rider up to Eagle’s Nest, where lessons and clinics meet their instructors. From this vantage, even first-timers can delight in the mountain views and play in the themed Adventure Zones designed for kids. 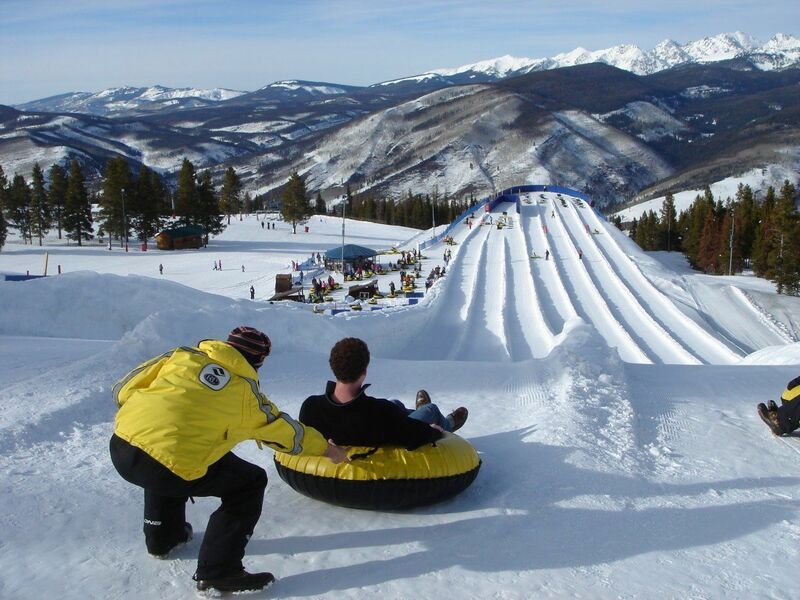 There’s a large cafeteria serving Vail’s popular Epic Burger (and it’s smaller cousin, the delicious cheeseburger made with locally-raised beef), and the Adventure Ridge play area that features tubing, mini-snowmobiling, trampolines and seasonal sports. Winter fun is enhanced by Vail’s Guest Services Ambassadors, volunteer skiers and riders who lead free Vail Mountain Welcome Tours of the mountain and their favorite terrain each morning. On such a vast mountain (largest skiable terrain in the United States), it takes a local to find the best glades, easiest shortcuts and most snowboard-friendly catwalks, and the knowledge they share about reading the Daily Grooming Report is invaluable when you’re on your own. Shhh! They also have coupons for free hot chocolate whenever guests want to take a break. In summer, the fun continues at Lionshead with free concerts and Friday afternoon family events, Jeep tours, mountain biking, and endless pony rides, disc golf, more tubing and bocce ball mid-mountain at Adventure Ridge. When your family descends to the Village in the gondola, they can shop at such teen-magnet brands as Northface, Quiksilver and Burton, whose shops stay open late. Vail’s Jazz Festival takes place each Labor Day and Oktoberfest arrives early in September. Wellness is the focus of most visitors whether they’re at Vail for its world-class snowsports or its summer and fall season activities. Thus, the Arrabelle’s fitness room is packed with the newest LifeFitness equipment and the spa has a beautiful Roman style hot tub, juniper scented sauna and sky blue steam room waiting to soothe at day’s end. Access to these facilities is free, and for a fee, a robust menu of wellness and ache-reducing treatments await those who book ahead. If you want to go full luxe, your family can apply to join the Arrabelle Club, whose members enjoy their own private slopeside dining room, separate ski valet, First Tracks and other mountain perks for a membership payment and annual dues. Guest rooms are on par with the public facilities. Our family was delighted with an enormous room with two queen beds – very tall ones whose mattresses had been built up with a divinely comfortable pillow top, draped with fine cotton linens and a white down duvet that made them even more glorious to jump on. There was a huge closet and armoire with more than enough storage for three of us (including a fashion conscious teen), plus pretty wrought iron hooks by the door to hold coats, ski gloves and other outerwear. The no-fuss fireplace was gas-fueled but emitted enough warmth and light to make the room – already cozy from lushly upholstered arm chairs, dark wood furnishings and sleigh style beds – even homier. The oversize bronze granite bathroom includes a separate toilet closet, as well as a glass-enclosed shower stall and extra deep Jacuzzi tub in addition to two sinks. Nothing irks my family more than paying top dollar for a room, then being expected to pay for WiFi access, bathrobes and top of the line amenities. At The Arrabelle, kids of any ages can put on their bathing suits and grab hotel slippers and a bathrobe to visit the pool, and the toiletries include the spa’s signature lotions as well as the wellness soap, in the shape of a small rock, that is offered at every RockResort. Going a step further to anticipate every need, each room has a coffeemaker and tea setup with several herbal blends, a minibar that can be stocked per guest request, a hairdryer, ironing board setup, partners’ desk with comfy chairs at both sides, coin-operated laundry in the basement and in our case, a wonderful stone balcony that allowed us to overlook the skating rink in Vail Square and see what was happening. In addition to our large guestroom, many of which are “lockouts” or the extra bedroom of privately-owned condos, families can book one of 25 one-bedroom to five-bedroom condo units with beautiful kitchens (including granite dining counters, Viking stoves and chrome refrigerators that the staff will gladly stock for you). I toured a variety of rooms, each more grand than the next, largely due to the excellent decorating style of the homeowners. Though every unit must meet the group’s standards, some have deep forest green leather couches in front of fireplaces topped by fine modern art; others use a combination of plaids, furs, leather and velvet to create a very warm yet high style look. What distinguishes The Arrabelle most is the size of each unit, as everything is high-ceilinged and rooms are enormous, reflecting the affluence of the owners and the clientele who seek out the units. You’ll have to rely on their expert reservations staff to make the right room choice for your family, but there’s really no wrong one. Not interested in using your kitchen to make breakfast? The cozy Tavern on the Square restaurant (where we also ate a great, well-priced burgers and salad supper) is home to a healthful buffet of bagels and smoked salmon, cereal and fresh fruits, pastries and croissants, or a hot breakfast selection of eggs, roast potatoes, the state’s famous farm-raised bacon and sausage. Too much? There’s complimentary coffee, tea and hot chocolate in the lobby along with a selection of newspapers at breakfast, then hot chocolate and other beverages plus fresh-baked cookies each afternoon. And always, large crystal urns of water flavored with different fruits. Our son had to try them all and voted the fresh mountain water with apple slices his favorite. Room service is available, of course, but after a day of non-stop action, it’s sometimes more satisfying to drag your weary family out for a calm meal. Within Lionshead Village, several outdoor cafes vie for your apres-ski or apres-ride attention, as well as your family’s appetite. Centre V was not open at our visit, but hearing that the former chef from Aspen’s Little Nell leads their kitchen means we’ll return soon to try it. The Blue Moose is a favorite for its varied pizzas and salads. Our best dining experience required hitching a ride on a Snowcat from Adventure Ridge to the gourmet Game Creek Club for a truly memorable supper. The Club is actually a private retreat off the Game Creek Bowl for member skiers — who store their slippers there — by day. A don’t-miss evening is available year-round with advance booking. Seasonal menus include a three- or four-course selection of inventive American cuisine made with locally grown ingredients; imagine Rocky Mountain Elk tenderloin, Berkshire Pork Belly Bacon, or fresh Black Bass.) Kids’ offerings are served yet at the early seatings, children under 12 dine free, making Game Creek a top value family splurge in a very special, high in the mountains setting. While The Arrabelle lives up to the grandeur of its location, the friendly, unpretentious staff make kids and parents feel at home. Set your GPS for The Arrabelle At Vail Square, a Rock Resort (877-808-4104), located at 675 Lionshead Place, Vail, Colorado 81657. Seasonal Rates: $$ – $$$$$. Great early season and late season deals make this affordable luxury.